Educators: We’d love to have your students help us name our new yeasts. Here’s some information to start the discussion with your students so that they can learn about the science of yeast. Yeast are single celled organisms that are microscopic. They are actually fungi (like all mushrooms). They are a group of microorganisms that include about 1000 unique species. Yeast make more of themselves by doubling—making copies of themselves that “bud” off once they are the same size as the original yeast. 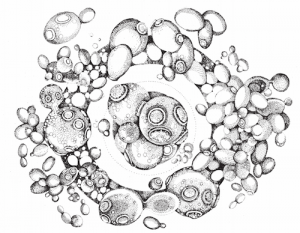 See here for an artist’s drawing of yeast that you can download and color. Look for the young yeast cells that are budding and growing off of old yeast cells. Or you could print a model of yeast cell from the outside and inside using a 3-D printed yeast. Yeast are found all over the world—from the coldest parts of glaciers to the dust bunnies in your home. Most of them love sweets, so they are often found in high sugar environments like flower nectar, rotting fruit, or in tree sap. Like all life forms, yeast take in nutrients and food-stuff and produce waste products. Unlike some other life forms, they are very good at eating a variety of things, and making valuable waste products. Some of their waste products are our favorite foods, flavors, and aromas. Yeast help transform grain and water into nutritious and tasty bread. They help us make donuts, chocolate, coffee, beer and wine. But they can also make valuable waste products like oil or many chemicals we use to preserve food, or even make cosmetics. Why is the Dunn Lab interested in studying the science of yeasts? Yeast are incredibly important to humans, and other animals, yet we use only a handful of yeast species to make most of our foods, beverages, and technology. In the Dunn lab, we are exploring the secret relationship insects have with yeast to better understand the mysteries of our world. 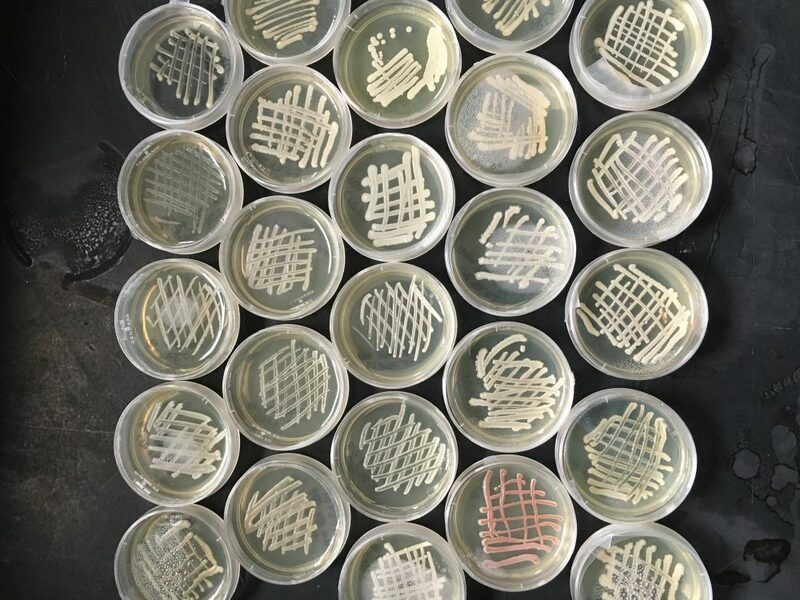 We are also working hard to understand how these new insect yeasts might help make new things. We’ve already had success using these insect yeasts to make new sour beer technology, but that’s just the beginning. Want to grow yeast in your own home or classroom? Cut potatoes into flat circles and boil for 5-10 minutes until tender, but not soft. Mix active dry baking yeast with a tiny bit of water. Using a Q-tip, transfer some of the watery yeast mixture to the potato. Over the next three days, watch as the yeast start to grow on the potato. Once there are billions and billions of cells, you will start to see them all look like tan toothpaste. Safety First! 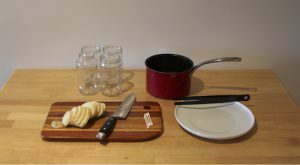 Please use proper care when using the stove, sharp knives, and boiling water. After the activity is complete, throw away the potato and yeast, do not consume them.